On Thursday, December 3, WNYC's The Greene Space and Classical 105.9 WQXR together with Music Unites will host the New York premiere of Twin Spirits, a poetic meditation on the passionate relationship between Robert and wife, Clara Schumann. Following the film, WQXR host Elliott Forrest will convene a conversation with the film's leading couple, Sting and Trudie Styler. In addition to the live studio audence, listeners around the world will be able to watch the film online through a live video stream at www.wnyc.org/thegreenespace and www.wqxr.org beginning at 6:30 pm, followed by an audio stream of the post-film discussion. The evening is being held as a benefit for the New York-based music education charity, Music Unites, and the Royal Opera House Education programs. Released this fall on DVD and Blu-Ray disc on Opus Arte, Twin Spirits tells the story of the passionate romance and subsequent marriage between composer Robert Schumann and pianist and composer Clara Wieck. 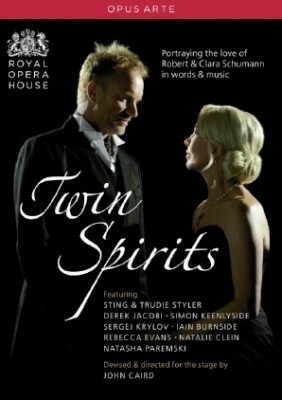 Twin Spirits brings together nine diverse performers of the highest caliber: Sting joins his wife, actress, producer and philanthropist Trudie Styler to read from the letters between Robert and Clara. Their story, narrated by Sir Derek Jacobi, is illustrated and interwoven with music composed by Robert--whose spirit is embodied by pianist Iain Burnside, baritone Simon Keenlyside and violinist Sergej Krylov - and by Clara, who is evoked by pianist Natasha Paremski, soprano Rebecca Evans, and cellist Natalie Clein. This "beautifully constructed" production (BBC Music Magazine), a subtle and moving fusion of recital and drama, was devised by the stage director and writer John Caird.